The people who come to Sarah house each year are all of low-income, many very poor, some homeless. Many pay nothing for their care, the rest pay very little. More than a humble charity, Sarah House was born of the spirit of social justice, from the reforming belief that loving care for the dying should be a human right for all and not just those who can afford it. Your support keeps the doors of Sarah House open and provides care to many needy individuals in the Santa Barbara community. We rely on your financial contributions, volunteer hours and donated goods. 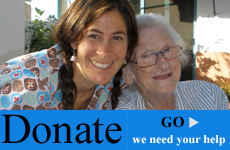 Please consider making a gift today!